Red Velvet Cake Recipe for two, made in a small 6″ round cake pan. Stacked with cream cheese frosting that is so good, you’ll lick the bowl! A perfect Valentine’s Day dessert for two. 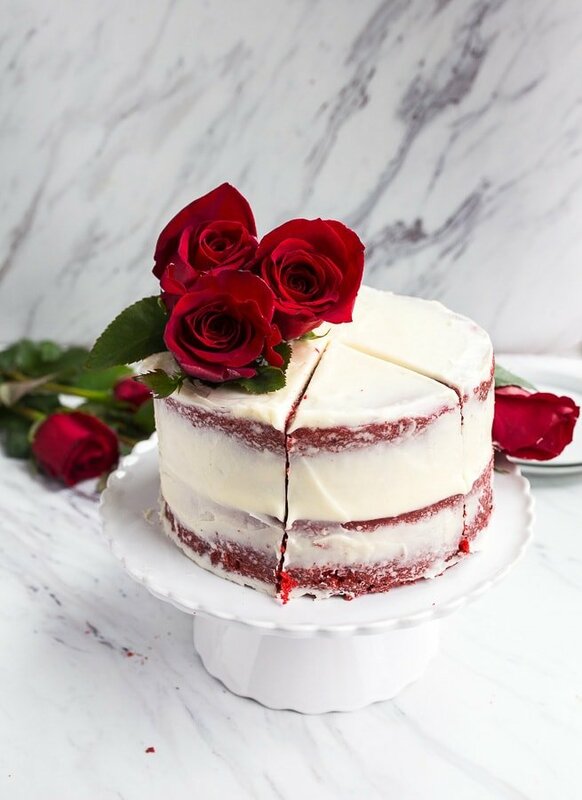 This small red velvet cake recipe for two has been on my To Do list for a while. Ever since my Mom discovered that you can double my Red Velvet Cupcakes recipe and bake it in a 6″ cake pan for a single layer cake, I’ve been meaning to make this! My Mom is a good indicator of which recipes we should make for the site. Did you see her guest post of Lobster Mac and Cheese for Two? Don’t miss that one! Technically, we doubled the red velvet cupcake recipe to get enough cake for my Red Velvet Truffles, but we never stacked it with cream cheese frosting like an actual cake. As soon as it comes out of the oven, I crumble it to make the cake balls. 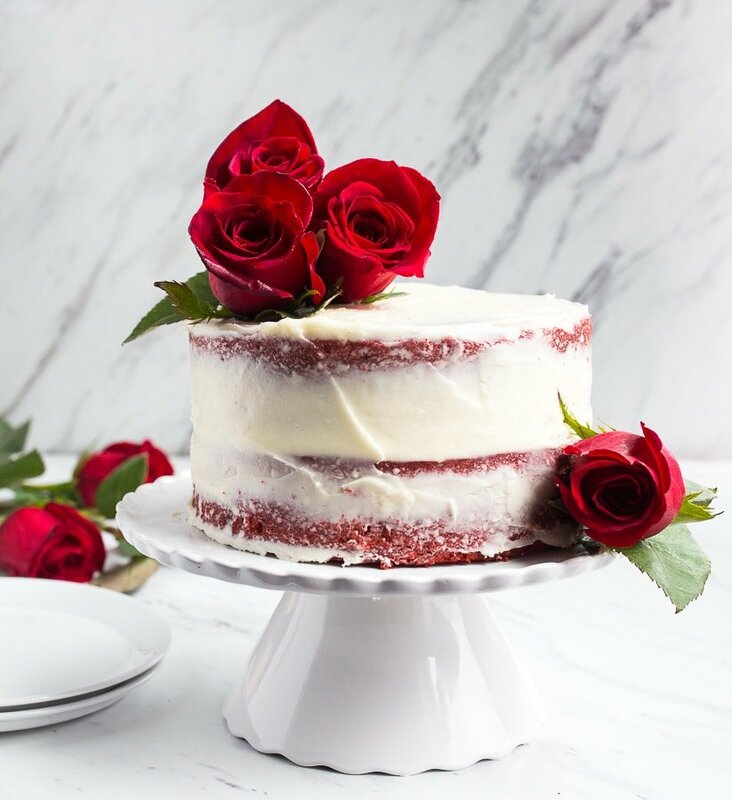 Red Velvet Cake recipe, you have been waiting so patiently for your moment! Well, it’s your day–the day before Valentine’s Day when everyone grabs the red food coloring and bakes a cake! Use any leftover food coloring to make these Red Velvet Sugar Cookies, okay? Technically, this recipe is a quadruple batch of my red velvet cupcakes, baked in two 6″ cake pans. 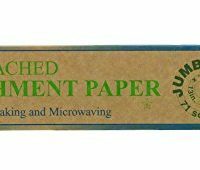 It makes one small 6″ two-layer round cake that is perfect for two people, or perfect as a wedding cake topper. Did you have a red velvet wedding cake? I must know about this! My wedding cake was a mix of carrot cake and vanilla cake layers, but if I could do it over again, it would be red velvet! As a Texan, I always feel the need to ‘educate’ a bit on what red velvet cake is and what it is not. 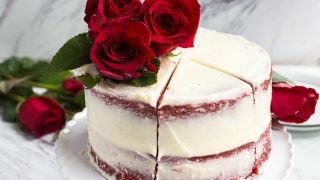 Red velvet cake is a buttermilk-based vanilla cake with a small amount of cocoa powder added. Red velvet cake is not a plain white cake with food coloring added. Are we clear on that? I don’t know why that bothers me so much, but it does! I don’t want you to miss the true red velvet flavor and magic that is tangy buttermilk meets soft, tender cake with a slight touch of cocoa. How is red velvet cake different? I’m so glad you asked this! Red velvet cake uses an unusual chemical reaction to make the cake rise: vinegar and baking soda! As it turns out, the acidity in the vinegar allows the red food coloring to become even more vibrant while baking. The acidity of the cocoa powder comes into the reaction, too, and produces a soft and tender cake that has the texture of, well, velvet! 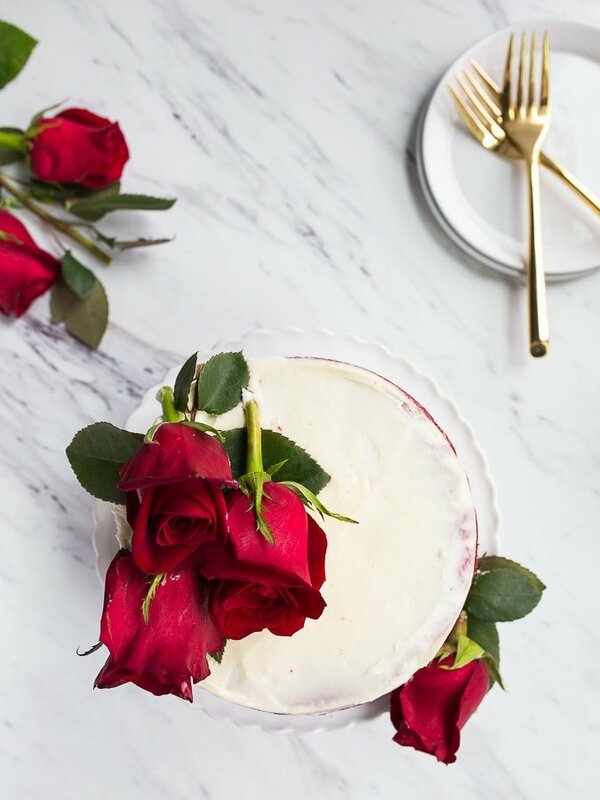 This small red velvet cake recipe is the sweetest way to celebrate Valentine’s Day! The cake makes about 6 small pieces of cake, and since it’s a layer cake, it’s a very generous serving! It can comfortably serve 4 people without much leftover, just in case your Valentine’s Day celebration involves more than just one other person. 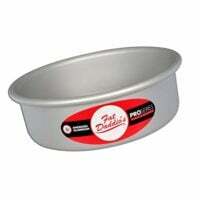 I’m using two small 6″ round cake pans with 2″ sides. I don’t recommend the taller cake pans because they can have a tendency to cause the cake to sink. On that note, anytime you remove a cake from the oven before it finishes baking completely, it will sink. Always test your cakes with a toothpick, and look at the sides of the pan to see if the cake is pulling away from it. If you’re brand new to the red velvet cake world, let me tell you the best news: the icing on the cake! It’s a cream cheese frosting, and it’s the queen of cake frosting. Cream cheese frosting is a buttercream made with butter, softened cream cheese, powdered sugar and vanilla. I add a small amount of heavy cream to help it whip up into the fluffiest, smoothest frosting ever. It’s best to make cream cheese frosting with nearly room temperature butter and cream cheese. If the cream cheese isn’t properly softened, it will clump in the frosting and be impossible to smooth! For decorating this cake, there are so many directions you can go. I like the look of a ‘naked cake,’ which is when a minimal amount of frosting is placed on the outside of the cake and then swiped off. In this case, I make sure to pack quite a bit of frosting between the cake layers to make up for the lesser amount of frosting on the sides of the cake. See how, in my photo, you can see the edges of the red velvet cake recipe peeking through? I love this! However, this cream cheese frosting recipe makes enough to frost the cake in the traditional way, if you wish. I like decorating the cake with fresh red roses (make sure they’re unsprayed), but sprinkles or strawberries would be so festive, too! When you slice into this cake, it reveals the prettiest layers! You might notice that this cake only uses egg whites, not egg yolks! This keeps it super tender and light, and plus, the egg yolk might interfere with the red color! But just in case you struggle with leftover eggs, I’ve got you covered! All of my recipes that use egg whites. All of my recipes that use egg yolks. Just a note about the measurements in the cake: you’ll see some strange stuff, like 1 1/3 cups plus 1/4 cup. I want you to add 1 1/3 cups of flour to a bowl, and then add another 1/4 cup. I quadrupled my small batch cupcake recipe to make this cake, and some of the numbers came out this way. It makes for a perfect cake, though, so have patience and bake with precision. I hope you guys have a great Valentine’s Day! Please let me know if you have any questions, and I would love see a photo if you make this cake. Enjoy! Red velvet cake recipe for two people. Made in a 6" round cake pan with two layers. Line two 6" round cake pans with parchment paper on the bottom, and then lightly spray the sides with cooking spray. In a medium bowl, beat together the canola oil, sugar, buttermilk, egg white, red food coloring, vanilla, and vinegar using an electric mixer. In another bowl, whisk together the flour, baking soda, salt and cocoa powder. Slowly add the dry ingredients to the wet ingredients, while mixing. Divide the batter between the two cake pans, and bake for 25-35 minutes, until a cake tester comes out clean. Let cool completely on a wire rack. When cool, tip the cakes out of the pan, and remove the parchment liner on the bottom. Once the cake is cool, make the frosting. Make sure everything is room temperature (except the cream). Beat the cream cheese and butter for about 45 seconds to break it up. Begin adding the powdered sugar one cup at a time while beating. Add the vanilla extract and heavy cream, and beat again. Add extra heavy cream if needed to form a fluffy, spreadable frosting. Place one cake layer on a serving dish. Add a heaping one cup of cream cheese frosting on top, and spread it almost to the edge of the cake. Add the other cake layer on top. Add the remaining frosting to the top of the cake, and using an off-set spatula, move the frosting down the sides of the cake. Use a cake scraper or bench scraper to smooth the sides of the cake. Serve immediately, or store in the fridge until serving. *We just need the egg whites for this recipe; save the egg yolks for another use. Looks delicious, I want to make this ASAP! 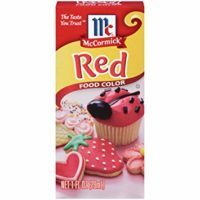 One question—do you think I can omit the red food coloring? 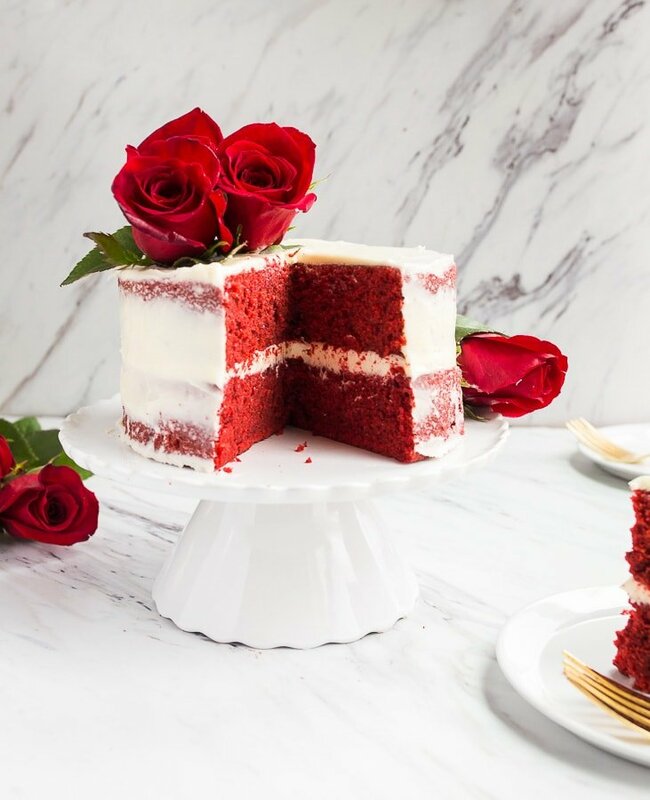 I love your description of how a red velvet cake is different then a white cake, but I’m wondering if the food coloring has any chemical purpose in the cake or if it could be omitted. But now you have got the best measurements and I shall do it again!! Cheers! I love that you’ve already basically made this! Thanks for letting me know :) I hope you enjoy this! Mmm….I can’t wait to try this little cake. Found this just in time for our 13th anniversary which is Feb 18th. Extra special as we DID have red velvet cake for our wedding cake! At the time no one really knew what it was but it was a huge hit! Thanks for this little treasure! 5tbsps flour & 1 cup milk in saucepan – stir over medium heat until a paste, cool. Whip 1 cup butter with 1 lb. powdered sugar, add 1 tsp vanilla. Then on high speed whip paste into butter/sugar & mix until light whipped cream texture. Cake layers should be sliced into two making 4 layers (I use thread) so Cake is almost like a torte. I’ve made this cake for 55 yrs! Could I use avocado oil or coconut oil instead? I’m trying not to use vegetable or corn oil. You can use any neutral oil, except coconut oil. Coconut oil can be solid at room temp, which will make your cake thick and tough. Avocado oil, or grape seed oil are great! The cake is so adorable. I am not a fan of red velvet but I might give this little cake a try. One question, maybe two….does it matter what type of food coloring …liquid, paste or gel? If so, would the amount added vary depending on the type? Finally, I have to comment on your beautiful new website design. I love, love, love it and it sees perfectly “you”. I love your recipes, your very enjoyable blog posts and your amazing photos. Do you have a small batch recipe for 7-Minute Icing? Cream cheese frosting is good but I think 7-Minute is even better on Red Velvet and chocolate cakes. I don’t, but I’ll get to work on that. I agree–7-minute frosting is delicious! I have to admit that I don’t understand the appeal of Red Velvet Cake. The few times I’ve had it the only thing I can taste is the food coloring.